The Ivory Marginated Beetle (Anomala marginata) showed up at the house recently. Although this little beetle is quite common throughout the Eastern US, most people never notice them. If they do see one, it is often mistaken for a Phyllophaga, the super common and super brown May beetles. But look closer. 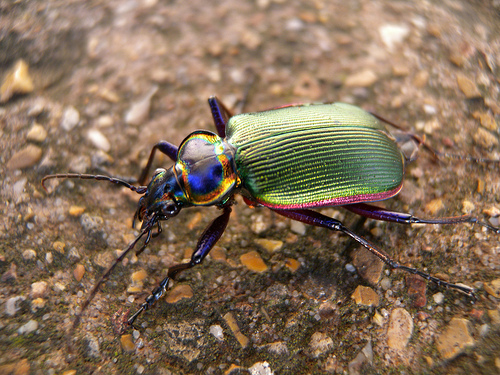 Once you notice the brilliant iridescence on every surface, they are easy to spot even in a bucket of May beetles. The ivory-colored bands on their legs and edging along the thorax stands out against the shimmering green and gold iridescence. 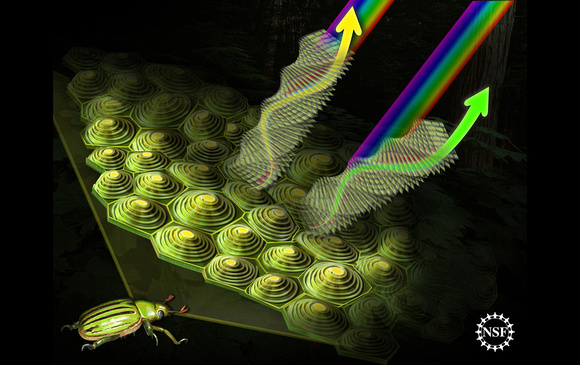 The light dances across its surface as the beetle walks across your palm. It is giving my ring a run for its money. Who can resist that cute face? 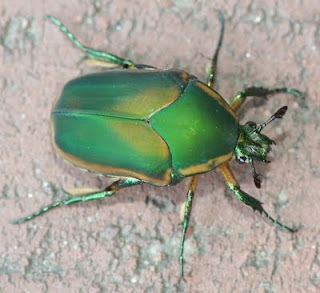 This is actually a Ruteline scarab (as opposed to a Phyllophaga). Rutelines are among the most beautiful and sought-after beetles. In many traditional cultures, the wing-covers of Rutelines are used for the original art nouveau jewelry. Science has only recently understood how insects create these spectacular colors. Very fine, transparent chitin layers of varying thickness manipulate the returning wavelengths of light, depending on what angle you are viewing the beetle. All of this is created without the use of any pigments. Any combination of visible light is possible: violet, orange, blue, silver, copper. If you can imagine it, a beetle somewhere has mastered it. Of course, now that we know how the beetle light-show works, science is busy finding practical applications. The obvious includes paints and architectural surfaces. But this technology may also result in faster computers through optical circuits and chips. Moustached Tiger Beetle (Cicindela hirtilabris) This is the coolest beetle in the scrub. More on this one in a later post. My driveway might be the best place in the world to find them. 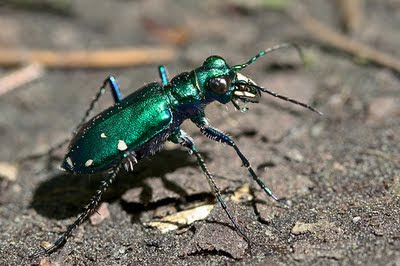 Why am I showing this beetle on a page about iridescence? 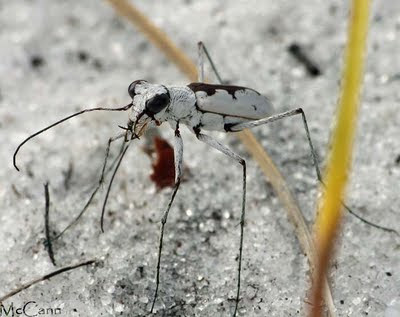 Check out my close-up photographs that reveal the moustached tiger beetle's colorful secret! Rainbow Scarab (Phanaeus vindex) These guys love bear poop.